Just like in any other industry, those that thrive in the affiliate marketing business tend to share certain traits worth striving to emulate. However, I’m not necessarily talking about how they optimize their sites, or the right or wrong ways to drive traffic. What I’d like to touch on in this article is more about the mindsets and lifestyle habits needed to perform at your best each and every day. Throughout my several years as an internet marketer, I’ve analyzed and picked up on quite a few common patterns most successful affiliate marketers tend to share. Now this article could easily turn into a novel if I tried and covered them all… so instead I’ve narrowed down a few of the most important ones that should have the greatest impact on your business! If you simply try to approach this business without a clear plan…you’ll quickly end up running around in circles chasing your own tail. It’s amazing how fast time can fly…you don’t want to be one of the many people that wake up one day years later…only to realize you haven’t really made much progress in building your business and reaching your goals. It’s important to treat this like a real business and set aside some time to create a plan. In fact, I highly recommend repeating this process at the beginning of every year. *What would you like to be at in your business at the end of the year? Will you continue to focus on affiliate marketing…or move on to developing your own products? *Prepare for the future. Are there any upcoming trends developing you can position yourself to capitalize on? Any changes happening in the industry you need to start adapting to in order to ensure your business’ survival? Think about your next project or campaign. How much time or money will you invest before determining if it is a winner or not? Under what conditions should you decide to scale up… or pull the plug on the whole operation? It doesn’t matter if you are a newbie or a veteran in this industry, there’s always someone out there you can learn something from and help you make more money. Just know this… nobody likes a leecher! You need to give in order to receive. It’s important to have an “abundance” mindset and not one of “scarcity”. You don’t need to be an expert on any particular topic…if you have genuine intentions to help others people will sense that and will be willing to lend you a hand in return. When I first got started in internet marketing, I was a little too focused…and ended up completely neglecting my health. As a result, I became pretty out of shape from a lack of exercise or any physical activity in general. I was actually walking around at 130 lbs at one point…which is a pretty low weight for my height! Even though I was spending so much time working on my business, I wasn’t really getting very far…because I wasn’t at my best physically. If you are familiar with Tony Robbins’ teachings at all, he places a lot of emphasis on physical fitness and other areas of your life. Once I started taking his advice and set aside some time to exercise and take care of my health …it had an immediate impact on my ability to work more efficiently. A couple years later, not only am I at my best physically…but my business is now thriving as well! Your health is a critical area of your life that you need to take care of, but make sure you are also giving the attention you need to other areas such as your family, social life, spirituality, etc. Always keep tabs on your competition. Analyze what they are doing right and think of how you can implement these things in your own business. Also, think about what they could be doing better and use that as a way to get ahead. Many folks make the mistake of not keeping proper track of their daily profits and expenses. It’s easy to get excited about generating $200 a day in sales…while ignoring the fact that it was at a cost of $150 a day in paid traffic or other expenses! If you are currently building a list (which you should be), know your average cost-per-subscriber and how much each subscriber is worth to your business. Another thing worth doing is to analyze your expenses and see if there are any money leaks you can get rid of. 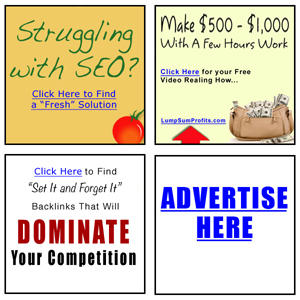 Do you really need that $100 a month backlinking software you rarely use? How often do you really log into that $50 a month paid forum? Are you paying for a larger hosting package than you really need? Any unnecessary expenses could be better used for launching new campaigns, and scaling up existing campaigns that are already making you money. Always be testing different elements of your campaigns. You should constantly be trying to increase conversion rates, opt-ins, email open rates, click through rates, etc. Most of us don’t have any shortage of good ideas. The problem is following through and taking consistent action towards an end-goal. It’s easy to develop “Entrepreneurial ADD” and get side tracked with new opportunities, products, traffic sources, etc. Try not to put too much on your plate at once. If you are already doing SEO, don’t try to master PPC until you’ve already reached your initial goals with that. Also, it’s always best to strike while the iron is hot and scale up something that is already working…then to start over and try something new. Need a game plan and some hot CONVERTING keywords to get started? Let us help you out.